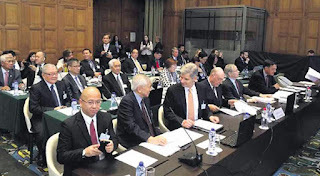 The mind over might strategy we saw in the recent legal battle of the Philippines against China at The Hague for the maritime jurisdiction of the disputed islands specifically in the West Philippine Sea demonstrates our dramatic show of force to stand on equal footing with wealthier and powerful giant neighbor. China through its ambassador to the Philippines Zhao Jianhua expressed his continued intentions to offer for bilateral talks with our country as the best way to peacefully settle these disputes. Prior to China’s aggressive actions in the South China Sea, it has indicated that it wants to avoid the internationalization of the dispute, as evidenced by its continued drive for bilateral negotiations. 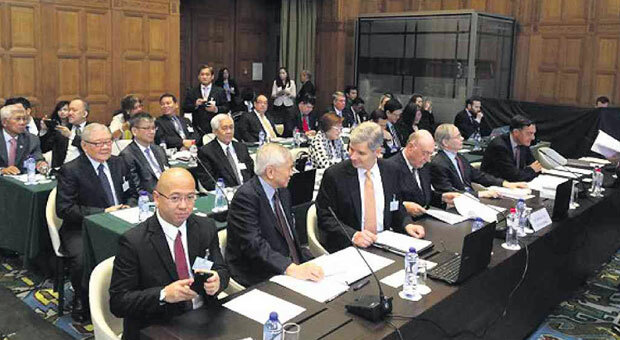 However, during the opening salvo speech of Foreign Affairs Secretary Albert del Rosario before the Permanent Court of Arbitration in Peace Palace, he asserted that the Philippines has diligently pursued to resolve the problem bilaterally and multilaterally for over two decades. Our government strongly believes to counter China’s ambiguous historic claims by espousing a multilateral approach to peacefully settle the maritime flashpoints. Despite diplomatic efforts, China thinks alone it possesses maritime rights in virtually the entirety of the South China Sea and that the Philippines must recognize and accept China’s sovereignty. Del Rosario enumerated incidents where China lawfully violated international maritime laws under (Unclos) - the Constitution of the oceans and forcibly seized and built structures in the disputed islands attracting dissenting opinions and violent reactions from the international community. A year ago, the Philippines proposed a multilateral Triple Action Plan (TAP) of ASEAN in the South China Sea, which identified Arbitration as the final and enduring resolution to address the destabilizing activities in the region. While China has indicated that it still does not intend to participate in the Arbitration case filed against it by the Philippines, the decision to issue a written response in the form of a position paper from China’s Ministry of Foreign Affairs indicates that China is indeed wary of the possible effects of the case. Given two hypothetical and plausible strategic dialogues for the Philippines to deal with its utmost challenging external threat today, how do we weigh our options in case multilateral engagements will falter and the only choice left would be bilateral negotiation? Bilateral negotiation strong points benefited the Asian way of looking at our historical bilateral trade relations with China when early immigrant Chinese founded the world’s oldest Chinatown in Binondo long before western colonization of the Spaniards and Americans including the Japanese occupation in the Philippines. Over the centuries until today, Chinoys and influential taipans and some intellectuals of Chinese blood have become assimilated in our society. Tina Clemente, a professor at the UP Asian Center describes the patterns of the bilateral economic relationships between the Philippines and China in terms of the investments, trade, labor, and Official Development Assistance (ODA) based from official statistical data, but the patterns look like asymmetric, critical and vulnerable. But China’s rising power has attracted many ASEAN countries to open trade with them as its best economic partners, thus to factor in hedging strategies. When I studied in Beijing at China’s National Defense University, my Chinese lecturers, most of them belonging to the Corps of Professors of the People’s Liberation Army were outspoken of bilateral negotiation to settle disputes with claimant-states in the South China Sea. They would often brag ‘respect’ and ‘trust’ on how they would shoulder the cudgel to painstakingly negotiate with sovereign smaller countries. Historically, bilateralism failed to provide just and equitable solutions to conflicts. This option was elucidated in highly controversial Agreements like the German-Russo Agreement in the late 1800s; German-Polish Non-Aggression Treaty signed in 1939; Non-Aggression Pact between Germany and USSR in 1939; and US-German Peace Treaty in 1921. All these bilateral treatises failed and resulted to war between and among those nations. Some strategists believe that bilateral negotiations should be engaged by two states with almost equal economic status and military capability. But even if with equal footing in terms of military might as the above-mentioned examples have shown, still bilateral treatises would fail and can damage the world security order. In this case, the Philippines is way below the Chinese maximum credible deterrence, economic prowess, and military power projections; therefore our country will certainly end up at the losing end of the bilateral talks. But there are recent notable successes in bilateral cooperation courtesy of excellent negotiation skills used to resolve territorial disputes in some other countries and regions including the 2007 Australia and Timor-Leste Agreement on the 50-year development zone and revenue sharing arrangement; China-Russia Bilateral Agreement in 2004 on the disputed islands of Amur and Assuri confluence and the Argun River; and Norway-Russia Comprehensive Maritime Boundary Agreement in 2010, to name a few. Some views that bilateral resolution of the South China Sea issue will foster maritime regional cooperation to the territorial disputes and it will pave more open communication between maritime law and enforcement agencies as well as setting up a hotline between foreign ministers for use in case of maritime emergencies. But the proposal looks ideal only for two countries with long tradition of ‘trust’ and ‘confidence’. Under a bilateral agreement, a range of preventive measures could ease regional tensions and de-escalate the risk of military conflict as both parties agree on resource-sharing agreement considering bilateral controlling mechanisms that would deter potential sources of conflict like illegal fishing and skirmishes arising from oil and gas exploration. Stronger military to military communication would increase dialogue to reduce conflict escalation. But greed and megalomaniac claims over disputed islands and atolls would ruin all facets of potential cooperation under ideal bilateral agreements. The Philippines has proactively engaged in multilateral approach in dealing with this security threat as the best prerogative since it involves many countries in Southeast Asia, Northeast Asia, and the Asia-Pacific in general with sprouting multi-dimensional regional and global interests that cut across political, economic, socio-cultural, techno-scientific, environmental, and military issues. The South China Sea dispute is multilateral in nature because it involves other claimants including Brunei, China, Malaysia, the Philippines, Taiwan, and Vietnam. Resolving issues between two countries will not entirely solve the dispute as other states are also claimants of islands. The dispute remains a potentially strong flashpoint especially with the ASEAN’s recent shelving of a proposed code of conduct that would have regulated aggressive activities of stronger claimants. The multilateral approach will also give the country leverage against bullying tactics of the giant adversary as it will put international pressure to its misbehaviors. The internationalization of the case should also be complemented by the Philippines’ continuous strengthening of relationships with its current allies. This is especially true for Japan, South Korea and other ASEAN countries where China has ongoing territorial disputes. Pessimist would argue that multilateralism is generally viewed as ineffective involving various parties with diverse interests which make it difficult to arrive at an acceptable agreement. It will also invite major powers in the region, not so much involved in the playing field, but will prefer to assume a neutral stance and declare non-intervention posture or may just verbalize pronouncements without tangible actions. In other words, it may not work in an anarchic international arena where interests of nations will define their wants. The diplomatic and legal actions our country may have chosen will certainly affect the kind of strategic culture we have mustered in the long run. The mind over might strategy we are pursuing will sum up our deterrence in this David versus Goliath maritime dilemma that we have had encountered with China. Paul Cornish and Geoffrey Edwards define strategic culture as a set of beliefs, attitudes and norms towards the use of military force often molded according to historical experience. Given our weak military might, alliance is a short-term remedy often favored than self-reliance as a long-term strength to better achieve modernized armed forces. It should also be noted that alliance as a form of strategic culture, apparent in bilateral or multilateral approaches, will not ensure the protection of our internal and external territories. On the other hand, some experts may deem that our shift to pursue Arbitration as a sign of soft power through the power of international laws that would serve as the greater equalizer among states, whether weak or mighty, has become our final resort to peacefully settle maritime disputes with China. Obviously, China is determined to show off its hard power in the Asia-Pacific as it continuously flexes muscles in the region. The dichotomy between hard and soft powers in terms of strategic cultures shown by the Philippines and China in defining their bilateral and multilateral approaches in the South China Sea conundrum would highlight two different poles on the continuum of power. Both concepts imply different ideas, interactions, persuasions, and institutions for foreign and defense policies when looking at the fields of politics, security, and economics. Christian Wagner deems that, ideally hard power strategies focus on military intervention, coercive diplomacy, and economic sanctions in order to enforce national interests resulting in confrontational policies vis-à-vis neighboring countries. In contrast, soft power strategies emphasize common political values, peaceful means for conflict management, and economic cooperation in order to achieve common solutions. Perhaps with a mix verdict in the arbitration tribunal and realistic intergenerational solutions in the naval saga, the Philippines should rather play its cards conscientiously and become pragmatic in its negotiations to fight for its maritime rights in the contested islands. Despite our bravery to seek legal means in settling our bilateral differences with China, whether we win or lose, the Philippines has indeed achieved a moral ascendancy to pursue international rule of law and gained the respect of the international community.